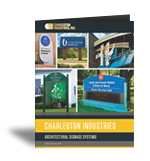 Charleston Manufacturing, LLC offers a broad selection of two-inch sign systems, comprised of the 218, 225, 250 and 250 Econo Series. 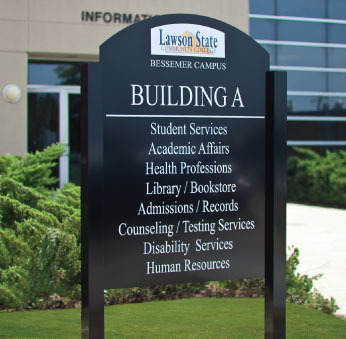 These post and panel sign systems are primarily designed for secondary applications, including directional, informational, regulatory and wayfinding. Our two-inch sign systems offer the designer flexibility, aesthetic quality and remarkable economy. These systems utilize the same profiles as the 325 and 750 Series, allowing the designer a uniform appearance in secondary applications. Post and Panel finishes include fifteen standard colors (page 12) in acrylic polyurethane. In addition, our in-house paint capabilities allow us to offer custom colors and/or color matching within standard lead times. Our finish quality is without compare. Graphics may be furnished by Charleston Manufacturing, LLC or installer.